Del Garda Village and Camping is a mere 200 metres from Lake Garda, which already promises much in the way of water-based fun, but this luxury camping site has so much more to offer. On-site facilities include a tennis court, a football pitch, beach-volleyball and a place for children to enjoy their camping holiday in complete safety. 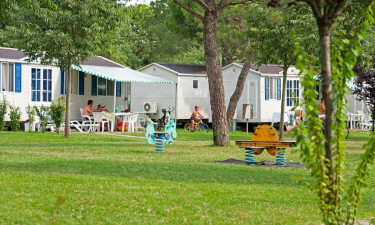 Book a beautifully appointed mobile home via LUX-camp and enjoy a holiday camping site set amid the spectacular Italian landscape. Soft, warm and inviting beaches on the doorstep. Swimming pools and slides that delight adults and children. A world of optional entertainment nearby. 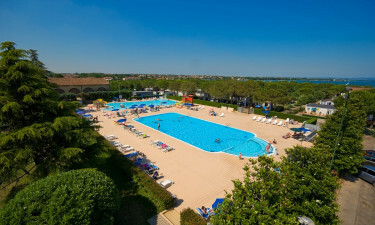 The beauty of holdiaying at the Del Garda Village campsite is that some of Italy’s most beautiful, renowned and romantic sites are within easy driving distance. Romeo and Juliet’s city of Verona, with its magnificent Roman arena, is a mere 22.86 km away, while the treasures to be found at Mantua beckon from a distance of only 33.19 km. A LUX-camp mobile home at Del Garda’s luxury camping site also allows guests the option of a 90 minute drive to Milan to bask in the city’s world-renowned arts and culture. 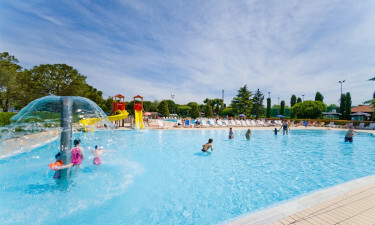 However, camping luxury entertainment begins closer to home with Movieland and Italy’s largest amusement park just a stone’s throw away from Del Garda Village and Camping. A camping holiday at Del Garda Village and Camping is perfect for those wanting to explore Italian village life at a more leisurely pace. A 45 km cycle path from Peschiera to Mantua allows for the opportunity to visit stunning villages like Borghetto sul Mincio en-route, and to sample the best traditional flavours of Italy. Just 36.51 km from the luxury camping site of Del Garda Village and Camping is the chance to view the magnificent Italian landscape from a cable car that, with its fully rotatable cars, allows a 360-degree breath-taking vista. Running from Malcesine to Monte Baldo, visitors enjoy 15 minutes of absolute splendour. 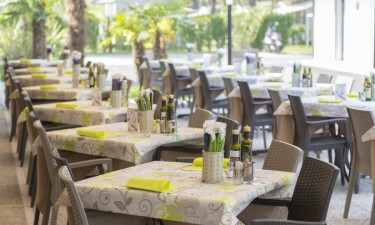 While a pool-side bar allows for aperitifs and lunch between sessions in the sparkling waters, a restaurant that offers all the famed flavours of Italy, as well as international dishes awaits the tastebuds. There are also cold beers and soft drinks to be enjoyed, as well as a pizzeria that provides a take-away service. 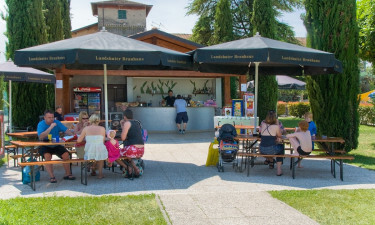 An ice-cream kiosk keeps temperatures deliciously down, while an on-site supermarket caters for other luxury camping necessities, as well as inflatable toys for pool-time fun and international newspapers that keep luxuriously relaxed minds in the loop. 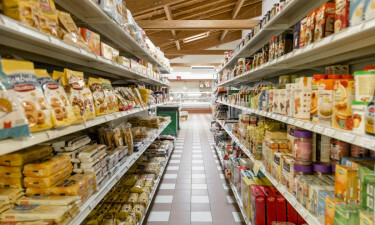 The close proximity of other towns and villages provides more than ample opportunities to enjoy local produce. It is a camping holiday that offers luxury camping at its best.